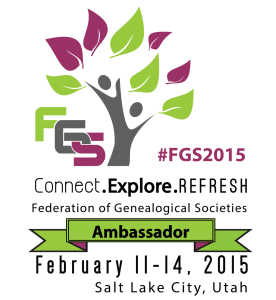 The theme for the FGS 2015 Conference in Salt Lake City is “Connect. Explore. Refresh.” What does that mean to me? The first genealogy conference I attended was FGS 2010 in Knoxville, Tennessee. This is where I found my tribe. People who were not only “interested” in genealogy, but who were serious about it. People who wanted to learn about methodology, record groups, and, generally, take it to the next level. I had made quite a few genea-friends through social media and FGS 2010 is where I met many of them in person for the first time. I also met people in classes, in the hallways, at lunches and dinners. And, of course, the bar. This experience has been repeated at every conference I’ve attended, whether it was SCGS Jamboree, NGS, or subsequent FGS conferences. FGS 2015 is a chance to connect and re-connect with my tribe. Since the 2015 conference is in Salt Lake City, that means I will be exploring the Family History Library. My first visit to the library was in 2013 and, even though I spent every available moment there, I still only scratched the surface of the research possibilities. Until you’ve been there, you can’t even imagine how much they have. When people say that it is the largest collection of genealogical materials in the world, they are not kidding. I haven’t started thinking about my research plan yet, but whichever lines I decide to focus on, the FHL will have sources to further my research. I’m adding a few extra days to my trip before and after the conference, so that I can have dedicated time to explore the Family History Library. Moreover, the library is in walking distance of the conference center and my hotel, so I will squeeze in some library time in between conference sessions, as well. I think others will nod their heads in agreement when I say that sometimes my research gets stale and my interest in genealogy wanes. And that’s okay, because sometimes I need to back off and spend time on other things. Genealogy conferences always (and I really mean always) refresh my interest, give me new perspective, and get me back on track. I’m at the point in my genealogy life-cycle where I spend less time in classes about “how to do” genealogy. I’m attracted to case-study lectures, because they remind me of what I know and how I should be approaching my research. Hearing about others’ challenges and successes refreshes my desire to come home and attack my own research. If you are thinking about attending FGS 2015, then I hope I’ve given you some reasons that will tip your scale toward yes. Early registration pricing is available through January 23, but I would encourage you to make your decision before the deadline. Hotel rooms in Salt Lake City will fill up quickly and tickets to special events may sell out.